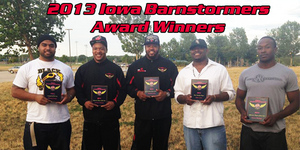 DES MOINES – The Iowa Barnstormers are proud to announce the winners of their 2013 team awards. Six awards were handed out at a private post-season party on Monday night after a vote by Barnstormer players and coaching staff. Winners are listed below. Defensive Lineman Mike Lewis was voted as the Barnstormers 2013 team MVP. Lewis is a four year veteran of the AFL, and was the Barnstormers top off-season recruit. Lewis did not disappoint, finishing the season with 31 tackles and 12.5 sacks. He has recorded double-digit sack number s in each of the past 3 seasons. Wide Receiver Marco Thomas was voted Offensive Player of the Year. The crafty Wide Receiver led the team with 142 receptions for 1,564 yards and 30 touchdowns. He also led Iowa with 124 rushing yards and 5 scores. Defensive Back De’Mon Glanton was voted Defensive Player of the Year. Glanton starred in his second season with the Barnstormers, leading the team in tackles (95) and interceptions (6). Known for his hard hits and aggressive play, Glanton became a Barnstormers fan favorite in 2013. Defensive Lineman / Linebacker Matangi Tonga was voted as the Barnstormers Lineman of the year. Tonga was a versatile player who lined up at multiple positions. In 15 games this season, he recorded 25 tackles, 3.5 sacks, a forced fumble, 3 fumble recoveries, 2 blocked kicks, an interception and he scored touchdowns on both offense and defense, making him the ultimate team player and Ironman. Linebacker Darnell Carter returned to the Barnstormers for a second season in 2013 and for the second straight year was named Special Teams player of the year. Carter was a key member of both the Barnstormers kickoff coverage and return units. However his most important role was that of the team’s long snapper for all kicks. Finally, Wide Receiver Marcus Harris was named the winner of the inaugural Ben Silverstein Character Award. The rookie playmaker was honored for not only his stellar play on the field, but his contributions to the local community as well.